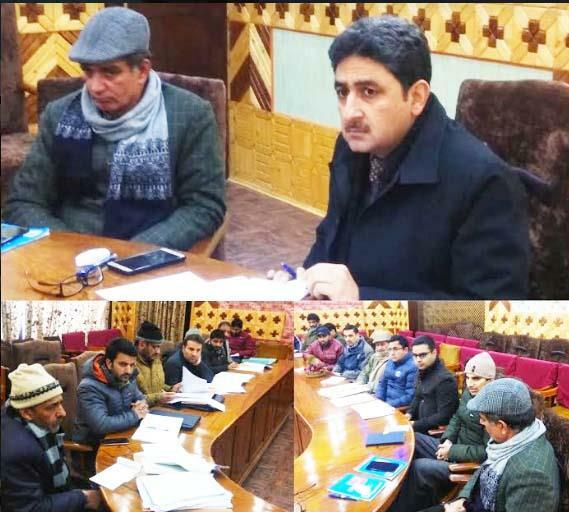 KUPWARA, FEBRUARY 09: District Development Commissioner Kupwara, Khalid Jahangir today chaired a meeting to discuss the issues related to the Skill Development programme under Border Action Development Programme (BADP), Special Central Assistance to Tribal Sub-Scheme (SCA to TSS) in district Kupwara. The meeting was attended by Additional Deputy Commissioner Kupwara, Mohd Yousaf Mir, Assistant Commissioner Development, Chief Animal Husbandry Officer Kupwara, Manager DIC, representatives of Social Welfare, Executive Officer of EDI and other concerned. On the occasion, DDC said that the local Walnut Processing Industry should be established in the district and the produce of manufacturers should be exhibited for better marketing. DDC directed the concerned officers to work together and frame the groups of the beneficiaries, at least four people so that they can avail more benefits from the schemes provided by the government through the Department of Animal Husbandry, Sheep Husbandry in collaboration with JKEDI. Department of Fisheries Authorities was directed to cooperate with the Rural Development Department (RDD) so that those beneficiaries who are interested in the making of fish ponds like trout units can avail benefits. These units will improve two important sectors of the district one is income generation and second healthy diet, said DDC. At least 50 successful units should be constructed by the end of the March, he urged. DDC also directed all the concerned officers to submit final reports so that they get registered on the portal. Meanwhile, DDC said that skills and knowledge are the driving forces of economic growth and social development in contemporary times.